Ireland has an amazing amount of castle ruins that are not on the tourist radar at all. Dotted all over the country in farmers’ fields, some not accessible without permission, you might see the high walls and battlements of a 12th Century Norman Castle in the distance and yet no signpost will guide you to it! It is very frustrating to feel like you’re missing out on some epic sites that could be properly signed and advertised in tourist brochures but then again, they wouldn’t hold that same sense of mystery and the feeling of having discovered a hidden gem all by yourself if everyone knew about them! Fortunately, we do have plenty of castles and ruined forts that are easy to find and not packed with busloads of tourists. 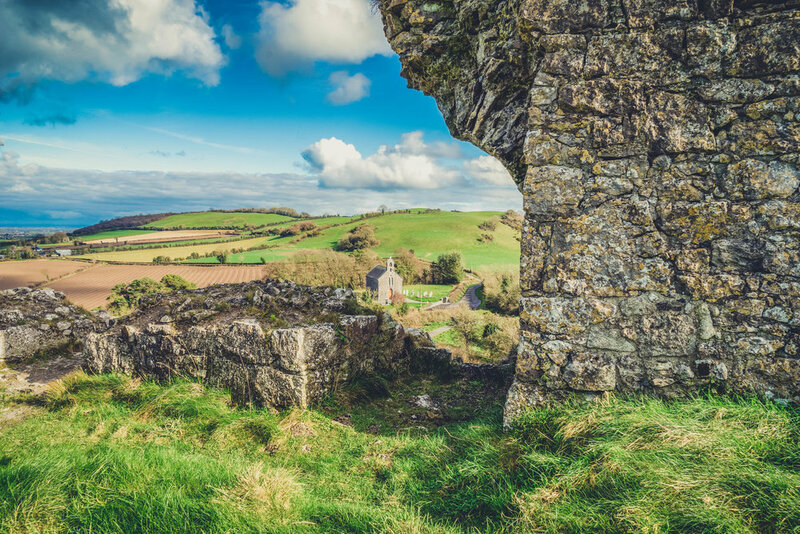 One of our favourites is The Rock of Dunamase and it’s an easy day trip from Dublin. The Rock of Dunamase is in Co. Laois, about an hour and twenty minutes from Dublin’s city centre by car. There’s no direct public transport but you can get to the nearest local town, Portlaoise, by bus or train from Dublin and from there, rent a bike (M Kavanagh Bicycle Hire, located on Railway Street) and cycle for about 20 minutes to the site. It’s a perfect location for a picnic, with stunning views of the surrounding landscape. We brought our trusty gas burner, a pan and a handful of delicious Irish sausages for our picnic. We neglected, however, to bring a lighter or matches to light the gas but, thankfully, some tourists came to the rescue and saved our sausages! We had a delicious lunch in the sunshine and it gave us the fuel to climb up the hill and explore every inch of this ancient site. 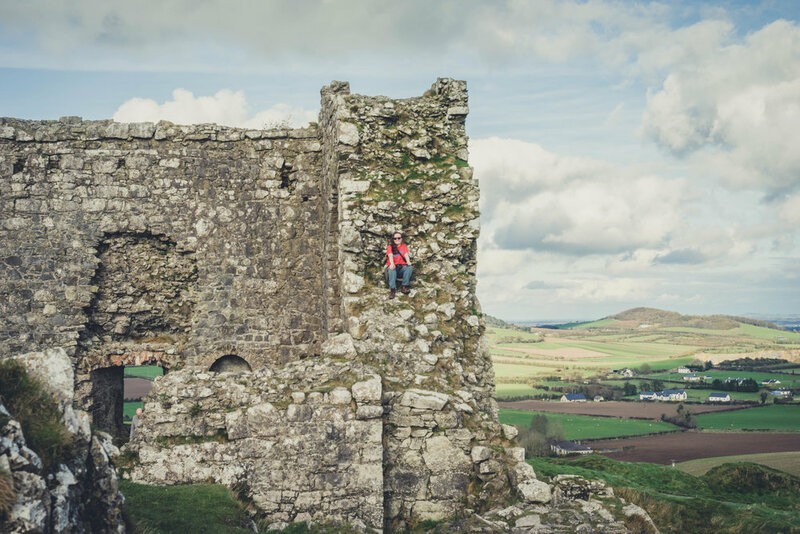 Built on a rocky outcrop, there is evidence that it was originally a defensive fortress belonging to Gaelic chieftains as far back as the 9th century. However, the ruins that you will see date from the 12th Century onwards as it became an important Anglo-Norman settlement and was further developed by the heirs of Aoife (the daughter of Ireland’s High King of Leinster) and Strongbow (Ireland’s Norman conqueror). It’s ruinous condition today is due to a bombardment of canon by Cromwellian troops in the 1600’s after it had been retaken by another Gaelic rebellion. 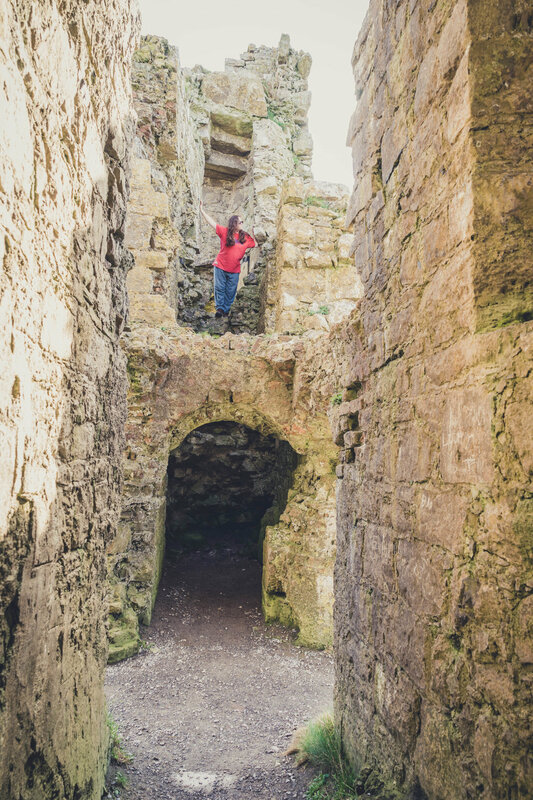 You can climb up to some of the windows (at your own risk of course) and imagine yourself as one of the archers defending the battlements and there are plenty of hidden spots among the old walls to sit and enjoy the views. It has seen a lot of change and sad times over the last 1000 years or so but we’re lucky we have this fantastic piece of history to explore and enjoy for generations to come. While we were enjoying a little wander around the walls of Dunamase we bumped into a friendly family of parents and a gaggle of kids who were on a similar day trip from Dublin. 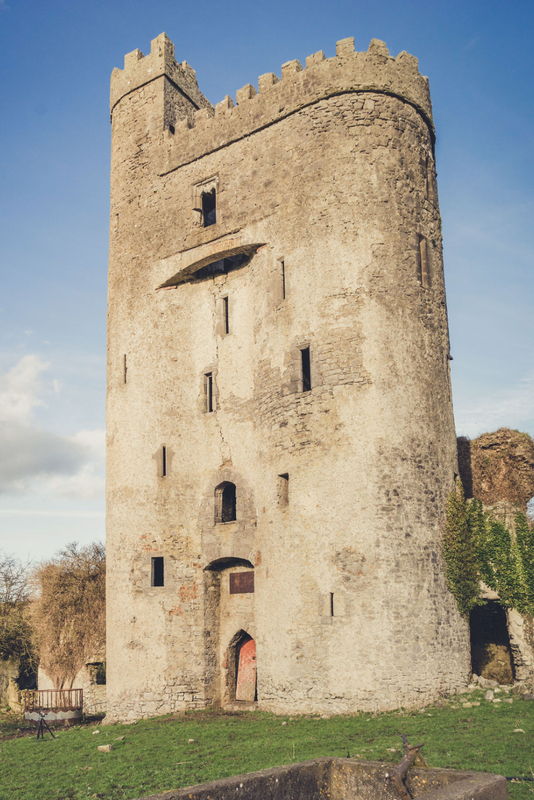 They told us they were on a mission to try and discover and explore every ruined castle in Ireland and they had just come across, what we now know to be, Ballyadams Castle. 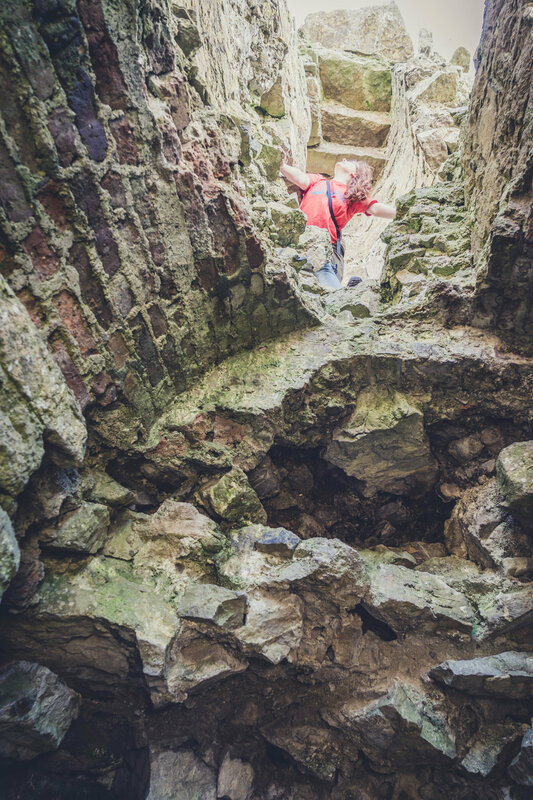 They were simply marking castles on google maps and, every weekend, taking a day to get out and find them, whether they were official tourist sites or just ruins on an old farm. They’ve inspired us to do the same and that same day we decided to check it out ourselves. 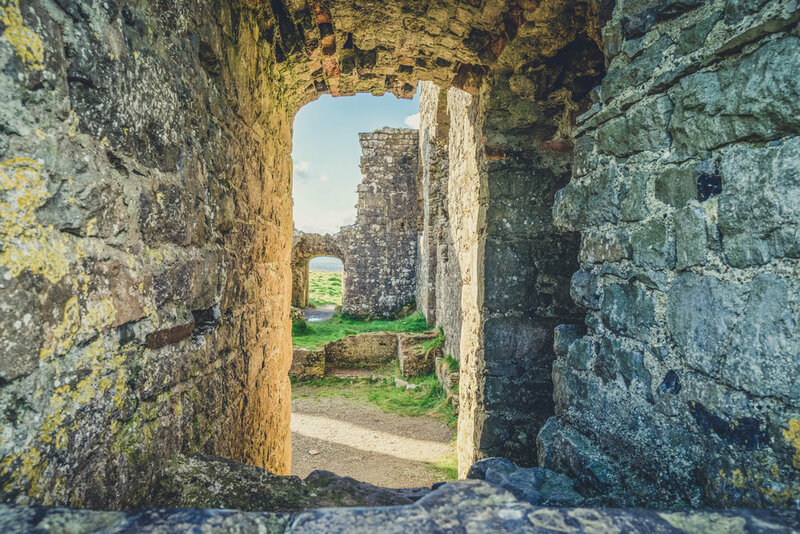 With a similar turbulent history and completely off the beaten path, Ballyadams Castle is about 15 Km away to the south-east of The Rock of Dunamase. The structure is impressive and surprisingly intact, given its probably around 600 years old. Even the big old iron-studded oak door seems like it was just left open by a careless castle guard! If you do want to venture inside it, be aware that it is entirely at your own risk. Unfortunately, there are no efforts being made towards its preservation and it is on private land (you might encounter some farm animals). You can choose to simply admire it from the outside or terrify the life out of yourself, like we did, by getting inside and climbing to the top! This is by way of a precarious stone staircase and a dodgy looking, rusty old ladder, so we really are not condoning this risky behaviour by any means! In fact, we questioned our decision the entire time and we didn’t linger at the top of the battlements, though the views are breathtaking. It is not on the tourist map at all and I’m sure it’s not meant to be, given its poor accessibility. But if you’re after adventure and a little mystery then you won’t be disappointed. It is one of Ireland’s many hidden gems that are waiting to be discovered and hopefully, someday, it will be properly preserved for everyone to enjoy. Be prepared for changing weather conditions and bear in mind that there are no toilet facilities at this site. However, there are plenty of options in the nearest town of Portlaoise where you can also grab a bite to eat if you don’t want to bother bringing a picnic. If you’re into sunsets and photography we recommend you climb the adjacent hill. It’s a perfect spot overlooking the site and provides an ideal vantage point for the golden hour. For more easy day trips you can do from Dublin, head on over to our posts about Glendalough Monastic Settlement, The Vale of Clara, Loughcrew Cairns, Newgrange and The Hill of Tara.